I will be the first to put my hands up and say that sometimes I can get a little obsessed with numbers. When you reach a record amount of page views or hit a certain number of social media followers, I'm not going to lie when I say it feels good (I achieved my goal for 2016 to reach 10k Twitter followers this week and actually had a little cry - what can I say, it was an emotional day! ). It takes a lot of hard work to grow a blog and social media and reaching these milestones should definitely be celebrated. However, I have learned that in the grand scheme of things, these numbers actually mean very little. Let me paint a scenario to you. Say a PR would like to promote their client's new perfume. They could look at North East Family Fun and think that I might be ideal. I have 20k+ followers across social media and my page views are very decent (especially at this time of year). However, I am pretty confident that I have zero influence when it comes to perfume. I've never written about it before and I think 99% of my readers would just read the article and move on. Take a smaller beauty blogger though who may only have 1000 followers across social media but has written extensively about perfume. Their readers trust their opinion on this subject and are already very engaged. Some of this blogger's followers may be tempted to make a purchase or find out more which is more than the zero result you would get if you had worked with me. (FYI I'm not trying to put myself out of a job here - North East Family Fun's readers love reading about North East openings & events, UK days out, travel, family products, family life, camping, food and restaurants - definitely not perfume though). Klout is a good tool for finding out where bloggers are influential. I see time and time again that PR's will ask for your follower numbers across social media but for me, it can sometimes be irrelevant. I urge PR's not to be tempted by these high numbers and instead look for real engagement and whether the blogger is a very good fit for your brand or product. The blogging world is super competitive and we all know someone who has bought fake followers. When you can do this so easily, you really need to start digging a little deeper when thinking about working with a blogger with high followers. Social media accounts with a high number of 'fake' followers are not going to offer a good return of investment to a client. *You can carry out a Twitter audit using a tool such as Twitter Audit . Simply type any Twitter handle into the site and it will quickly give you an idea of how many followers are real/fake. Similarly, you can use FollowerCheck for Instagram. (Please note - these tools only use a random sample so aren't 100% accurate but in my opinion, they provide a good idea). *Scroll through a blogger's Twitter/Instagram followers - after you get past around the most recent 300 or so followers, if most of them then turn into egg heads with no profile pictures, have fake names (eg just random letters and numbers) or if you click on most of their profiles they haven't posted anything but are following a lot of people, chances are they are fake. We all get fake/spam followers but when they run into 100's or 1000's, you need to discount them to find the real number of followers. *A massive tell-tale sign for me is when Instagram accounts with high followers receive around the same number of likes for every photograph and a fair few one or two word comments that are irrelevant ('nice pic' I'm looking at you). Sometimes this can be when you use a certain hashtag so it's not always fake, but I will put money on the fact that if it happens across most pictures then it's a robot doing this and not an actual person which discounts any real influence. Instagram runs on an algorithm so it's practically impossible to get near enough the same number of likes on every photograph, so if it seems too good to be true, it normally is. If you'd like a benchmark of how a 'real' Instagram account with a high number of followers should look like, I highly recommend checking our Ashlie from Sugar Rushed who definitely keeps it real. I'm not saying that high numbers are a bad thing. I think the ideal scenario is a blogger that has a decent number of engaged followers in their niche. As a blogger, I think the real measurement of success is when you receive a comment from a reader who has tried something on your recommendation. This could happen whether you have 10 or 10,000 followers. BLOGGERS: Don't compare yourselves to other bloggers with a high number of followers. Instead, focus on what you can offer. Save any comments you receive when a reader tries something on your recommendation (fab to add to your media kit/work with me page), keep the conversation going across social media and really focus on your engagement. To me, this is what counts. If you'd like to work with brands, try and find your niche and really focus on this. BRANDS: Yes, working with a blogger with a high number of followers does get your message out to more people. For example, I recently reviewed a local restaurant and my Tweets featuring this restaurant were seen by over 10,000 mostly local people (this is the actual reach of these Tweets as opposed to my 'follower' number - not every follower will see every Tweet). Considering lunch was worth around £40 (and would have cost the restaurant less than this), I feel that this is an excellent return of investment, especially when you consider that this is just a tiny part of the big picture (there was also a blog post, Facebook posts, Instagram posts ect.....). However please do your homework and check that the blogger you'd like to work with is in the right niche for you and whether their followers are actually engaged or appear to be fake. A few simple checks can make a huge difference on the real success of the campaign. Continue to work with bloggers who have a high number of followers but also please don't discount smaller bloggers in your niche too. They might just surprise you. 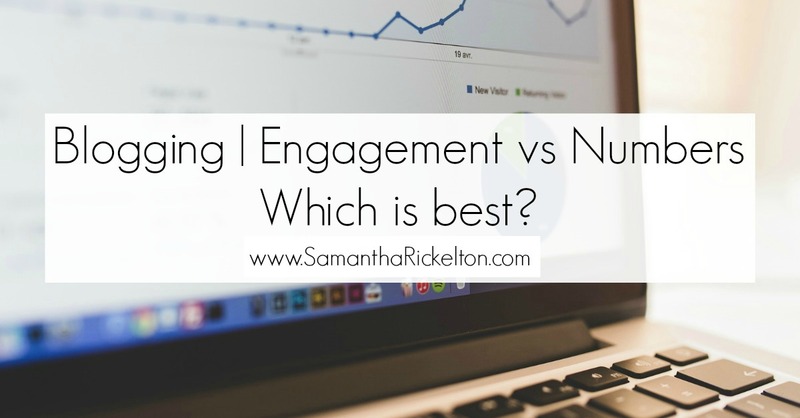 I'd love to hear your thoughts on this - do high follower numbers really matter or is engagement more important? I definitely think it's a balance - 100k followers and no engagement is pointless. 5 really engaged followers are wonderful but still only 5. I think more PRS are focused on engagement now for all the reasons you mention so it can only be good if you have smaller numbers but a loyal following. Off to see how many IG bots I've got - had twitter clean out recently and not too many thankfully! Really liked this article. Agree with it all too. Although klout thinks my niche is navigation though - clearly hasn't seen me drive! I didn't know about the Instagram tool - off to have a nosey! ha maybe you keep tweeting about being lost and needing a sat nav! Your Instagram feed is gorgeous Mandy. I always love looking at the scrolling banner of recent photographs on your blog and can't imagine seeing a random packet of crisps in there or whatever. Love this, you always give me something to think about. It's so easy to get lost in the numbers and lose the bigger picture! I think that you hit the nail on the head when you were talking about the perfume, I think the key is relevance. It's interesting that bloggers talk about numbers then quickly revert to social media numbers, rather than their blog numbers; 2 completely different animals. I've always thought of them as different, as you can have a social media account (and a great one at that) without a blog, but you can't be a blogger without a blog; Of course having both can be great if you are a blogger. As for fakes, I don't really look into it into this much detail, what is fake anyway? Is follow for follow fake? Like for like fake? Comment for comment? There's no real genuine interest or engagement...Of course I know you mean mass-purchasing fakes, but how different is this really? I've seen others blog posts with 30,40,50+ comments, pretty good at first glance, but when you actually look at those comments a lot of the time they aren't worth having and add no value.